The Gentleman Crafter: My Play Day At Kay's and The Winner! Wow! I had the most amazing day today! We were kindly invited over to my friend Kay's House for a day of crafting! Well...it was so much more than that! Great friends, amazing food, beautiful hill country views, a studio chocked as full as mine (LOL!) 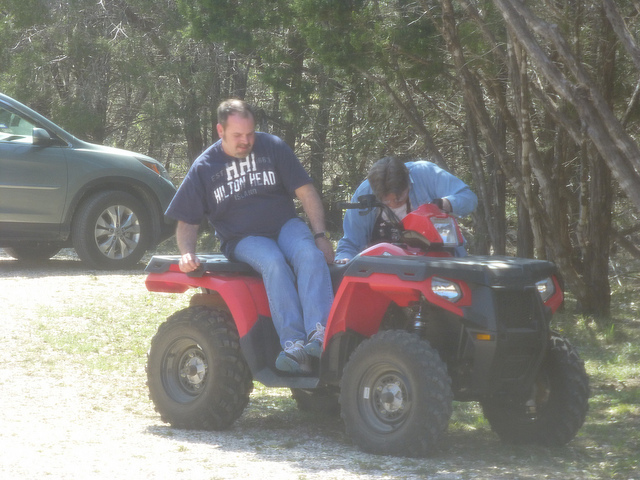 AND...last but not least....Kay gave me a ride on her four-wheeler! I was in heaven! Thank you Kay for allowing Cesar, Barb and I to partake in your awesome generosity...You are too kind! 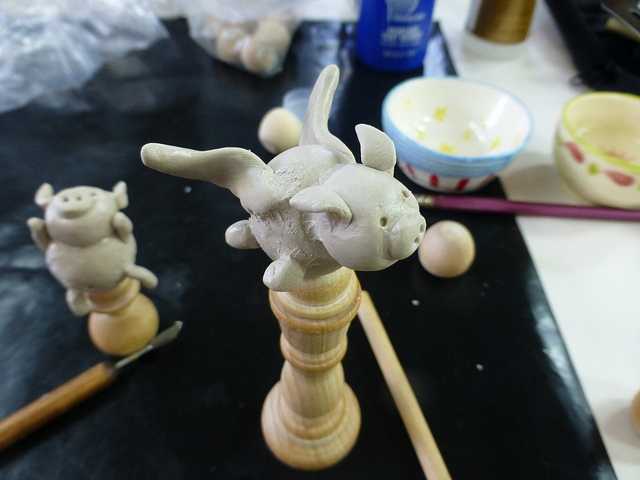 We all worked with Dylusions goodness, except for Cesar who worked on making flying pigs from wood clay....To Cool Cesar! WARNING!!!! FOR THOSE OF YOU WHO DO NOT LIKE COLOR AND BRIGHT STUFF....Please skip these next photos...Thank You! OK, Now on with the fun stuff...The Giveaway...Yahoooooo! Thank You All for your AMAZING comments and blog post looks! It sent the post to the Number 1 viewed post on my blog! You ALL ROCK! LOL! Thanks again! I really do appreciate you all!! holy crap that's bright lol Looks awesome though, glad you had a fun day. Totally loving Cesars pigs lol does he do flying giraffes??? Oooo...yeah! I'd pay for one of those! I love, Love, LOVE giraffe! nothing better than crafting with friends! I wanna go to Kay's house, I wanna ride on Kay's 4wheeler! Who do I sound like? I'm glad you had a good day. First of all your journal page is FABULOUS! So many details, every time I look at it I see something I missed. All the time you put into it really shows. Cesar's flying pig is so cool! I also got to craft last night and today, I made my first mixed media canvas. I just posted it to my blog, check it out and tell me what it needs if you get a chance. Looks like too much fun! Especially the pigs! How lovely to craft along with friends. Love your journal page.Hope you had fun on the bike.Looks like you did. Aren't "play days" with friends just the best?? Love the flying pigs Cesar!!!! Looks like a fun filled day for all of you! Glad you enjoyed the day with friends! Love your journal page! So wonderful! Congrats to Midge! 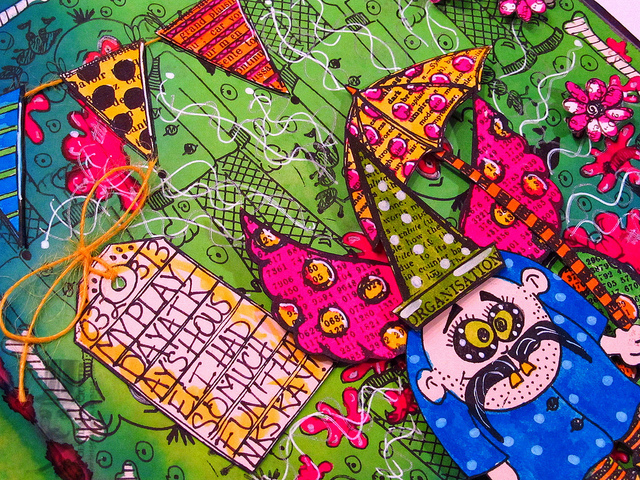 You will love the die, have fun creating, and enjoy Jim's lovely creation! I had such fun getting a look at your great day. A blast for all of you. The journal page is awesome. I love the five o'clock shadow on your fellow. Cesar - your pigs are fantastic. Congrats to Midge. Add my thanks to Kay for being a wonderful play date hostess!! We all had so much fun working on our individual journal pages and watching Cesar create the most fabulous piggies. 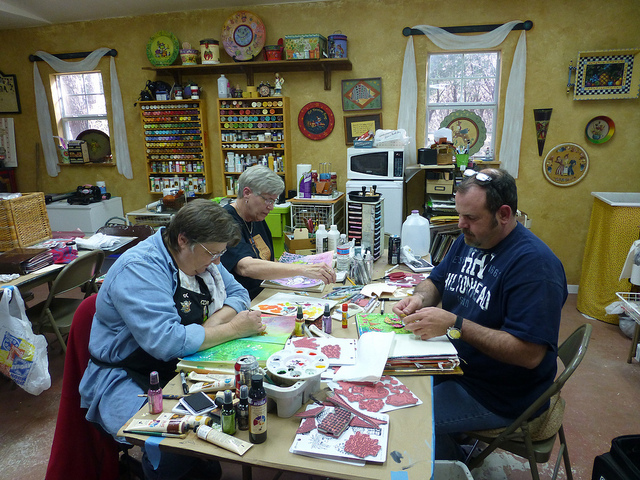 It was so cool to watch Kay and Jim create their journal pages...what talent!!! I forgot to say CONGRATULATIONS to Midge!! Lucky lady!! I know you're gonna love the die and the box Jim made is beautiful...your gonna love it, too!!! How fun is this!? It is good to let your creative juices go down a different path. It re-energizes your brain. Sounds like a fun day. What a fun crafty day! Thanks for sharing! So nice to have friends you can just hang with. Congrats Midge. Have fun with your goodies. What a great day you had! Love all those bright art pages. I think Dyan's " I am currently unsupervised . . . the possibilities are endless" fits your journal page perfectly :) I absolutely love it!!! 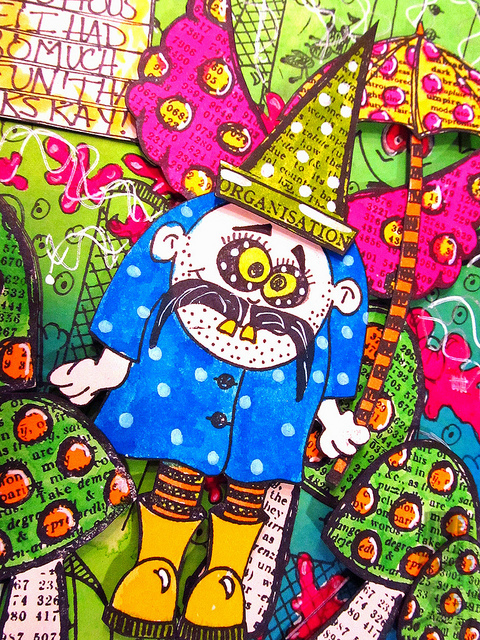 So much colour, detail, imagination and let's face it, more colour. Glad you had such a great day with friends. Cesar your flying pigs are fantastic! Congratulations Midge. You'll soon have your very own piece of Jim the Gentleman Crafter's amazing art and the brilliant Tattered Floral die. Wow what an amazing studio to go and play for the day in. Adore Ceasar's flying pigs they are fab. Finally your page is just full of crazy fun. You my friend rock. wow loving the flying pigs. Reminds me of when students would say yes groupwork done, it wasnt, so i started to say when pigs fly. I said it that often they got me some flying pigs for my office. Hi Jim, Love your tag with all it's layers. Fabulous. Your page is so much fun! You were channeling your inner "Dy" and really let loose on this one. Looks like a super fun day. Your journal page is just what this early spring storm needs! Love the colors. I'm so tired of drab and dull and then BAM! we get "in your face" colors with Dyan's line and even Tim finally adding some brights. Color my world with happy! Cesar's pigs are a stitch - wouldn't they be fun "flying" around a church steeple? Ooooh I'd love to play in Kay's huge studio! 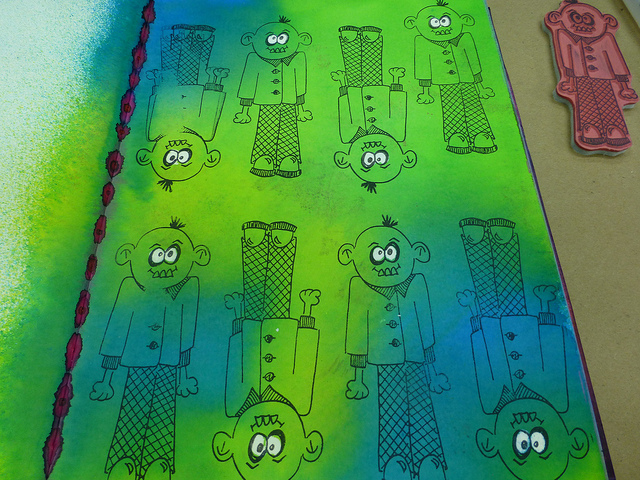 It looks like you all had a fabulous time and your colourful journal page just screams "happy" to me. Sorry Jim, but I have to admit that Cesar's piggies are my favourites! Cesar, I don't know what your day job is, but you are clearly wasted there - you should give it all up and make cute flying pigs - you'd make a fortune selling them (maybe they could have little knitted hats too)! Congratulations to Midge - owning an original Jim artwork is awesome! Scrappy, you won't be sorry. I took classes from Dyan when she was in TX last May and thought it was worth every minute of my time and every penny I paid to take the classes. Dyan is a wonderful teacher and a hoot, tool You'll LOVE her...and her classes!!! Fantastic! Bright & cheery is just what is needed I say. Love Cesars flying pigs. What a fun, fun, fun, day y'all had! 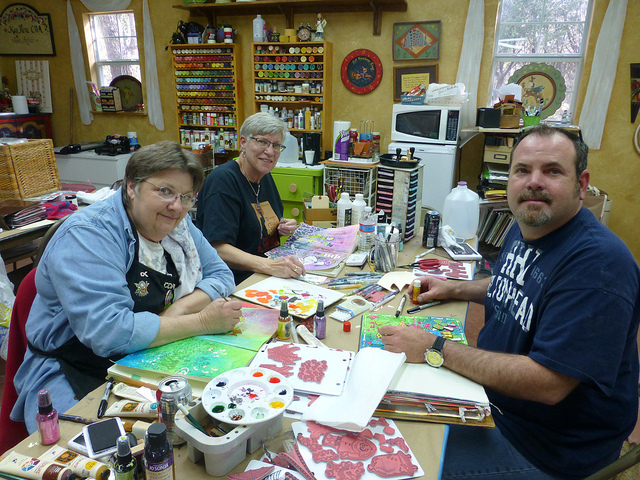 Kay's studio looks like a wonderful place to create in and relax with friends. . . 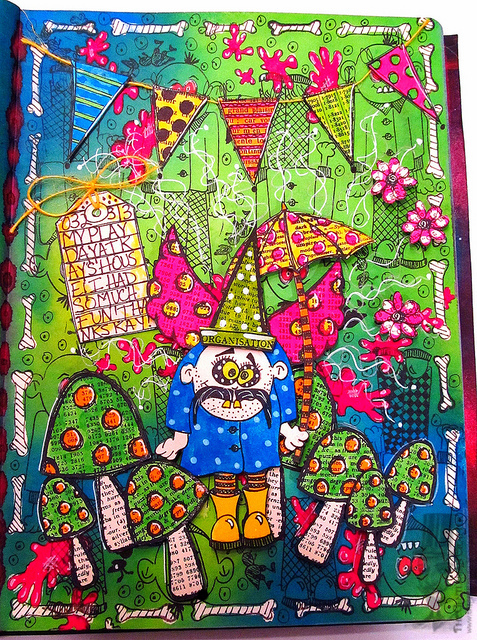 I love the many, many, many layers you created on your journal page . 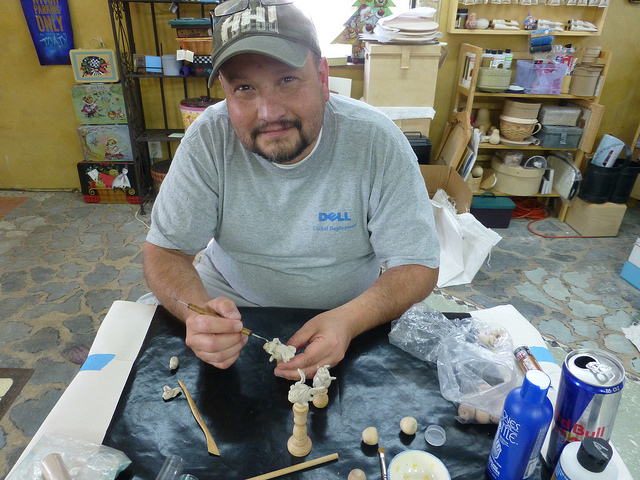 . . tell Cesar that he is going to have to do a "show & tell" on one of your Ustream Tuesday night's - I would love to learn more about "wood clay" . . . CONGRATS TO MIDEG!!!! Jim, looks like you all had a wonderfully fun day! I love those days! Looks like an incredible way to spend the day. What fun! Wow... looks like y'all had a wonderful time! Love your studio Kay!!! Your page turned out fabulous Jim! Cesar love your clay pigs! You All Rock! Have a fabulous day!!! I treasure my weekly playdate at my bestie's house. I always seem to get so much more done there...lol. The journal page is fabulous! Love those stamps! 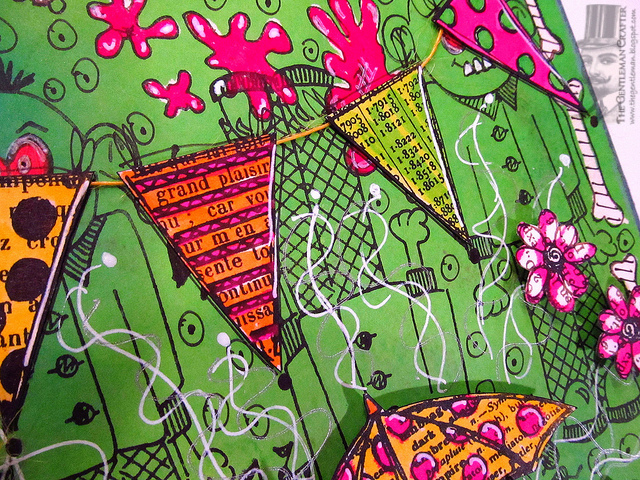 I'm not wild about the bright colors, I'm a bit more subdued, but I just LOVE Dy's stamps and stencils! Congrats to Midge! Ima hafta break down and buy that die I guess. Sigh. 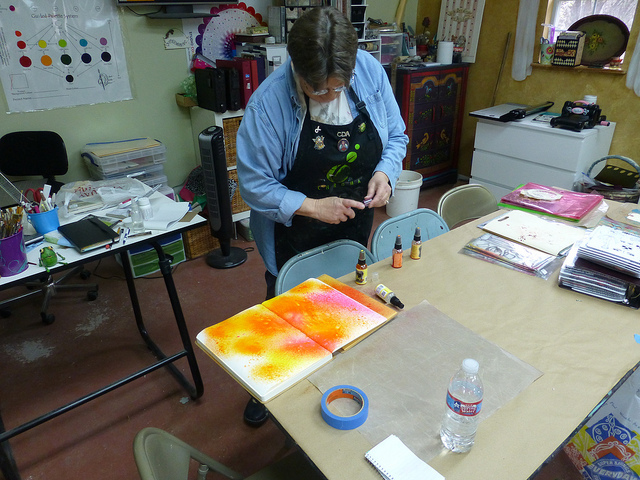 I can see where your colorful inspiration came from, just by being surrounded by all the color in Kay's studio. Wow--it was amazing--and to think that you didn't have to pack up a bunch of stuff from your own place and haul it off to Kay's. It was fun to see the evolution of your page from the single image repeated on the blue and green page to all the colors and layers of the finished page. It made me smile, as did Cesar's pigs. I want to see Kay and Barb's projects, too. Love Love Love the colors! And Cesar, your flying pigs are a squealing delight! I LOVE it! The bright colors, that face!!! What fun!!!!! So glad to see Cesar. I hear his voice but never see him. The flying pigs are just darling. Love your colorful page, Jim. This blog made me smile ear to ear. I think that the smiles are quite addictive. I just love the colors and the work, not work, fun!...yes, fun that everyone was having. Apparently my observation that the Easter cart project was so colorful that my eyes hurt is now being interpreted by you that I don't like color at all. A little thin skinned are we? Do you really believe the only options are day-glo colors or none at all? I shall refrain from commenting in the future since you only accept those that rave about every breath you take - suggestions to the contrary are unacceptable. Good Morning, well I was thinking that this page is going to be ok but not really something I like....then I looked at it and went WOW. just love it. Such a fun theme and it just pops. Kay's craft room is awesome. So much going on. Looks like you guys had a great day out...or in. Keep up the good work and keep the inspiration coming. Wow, I am so envious of you all, getting to work together in that amazing craft room! The creativity in that room must have made the air buzz...LOL! Your journal page just made me crack up! So fun and whimsical...I love it! Jimbo & Cesar, I LOVE IT!!! Cesar, will you be selling your flying pigs? Jimbo, how did you get the guys eyes to stay white in that first picture? And now I see another studio I want to play in. *sigh* My crafting "space" is ridiculously small. Congrats Midge! And oh what fun was had at Kay's!! So jealous! And Jim your dylusion stuff is awesome, more is more, right?! Cesar, love your little piggies, obviously you are a gifted artist too! I've never heard of wood clay but now it appears I need to find something else new to do. You guys are such enablers! I am in love with the pigs-they are so darn cute! So that's what you look like after a day of crafting! Love it! Love Caesar's pigs, too! You are so lucky to have a friend to craft with, and you got to ride in a four wheeler too! I love how your pages turned out, but I gotta say that I am simply adoring those pigs Caesar made! Too cute for words! Thanks for sharing your fun with us and congrats to Midge on winning the die!